The Colgems label limped into 1971 bereft of a talent roster, and literally on its last legs. 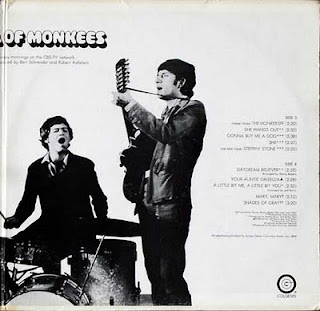 However, the Monkees TV show continued successfully in reruns on Saturday morning kids TV, and thus, a new greatest hits album--a double LP at that--was released to cash in on that popularity. Released in January 1971, "Barrel Full of Monkees" was a hodgepodge of hits and album tracks culled mainly from the first five Monkees albums. You can access this LP at http://launch.groups.yahoo.com/group/albumania/. 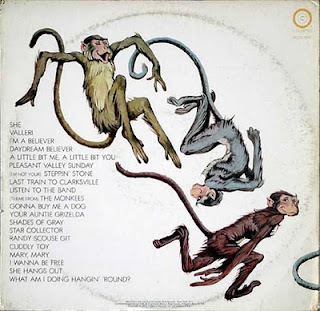 If you had Monkees albums at that time, you already had all of the tracks, sans another stereo version of "A Little Bit Me, A Little Bit You." Also somehow finding its way onto this double album was Mike Nesmith's "Listen to the Band," which is as out of place here as it appears to be. Coming from the group's last real stab at a true hit single, the track pretty much overshadows everything else here because it seems so out of place. 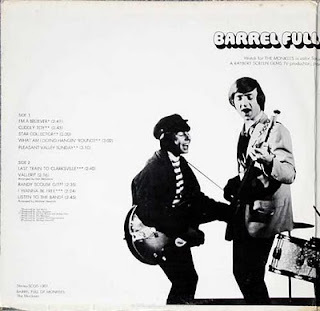 But you can't argue with what is on here, everything from "I'm a Believer" to "Daydream Believer" and many of the other big hits that the group had from 1966-1968. No, there is nothing from "Head" on here. What you can argue with is the cheesiness of the package. 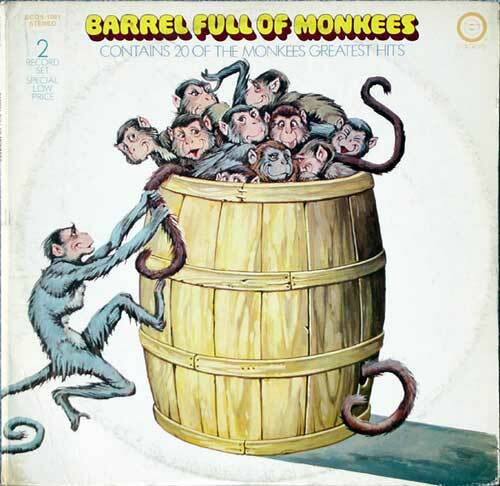 A "barrel full of monkeys" image is on the front and back cover--how could one of the most photographed groups of the mid to late 1960s be left off the cover? Open up the package, and you will see a photo from the early Monkees days, when Micky started to grow his hair out and they were still going to pass off Davy as a "guitarist." Well, at least Peter Tork is in the photo. With this release, the Colgems label closed down shop for good. However, there appeared to be at least two more releases planned for the label that never materialized. The first was "Lost Horizon," the LP to the big budget bomb, and the other was another Monkees greatest hits album, this one a single release and set to be called "Greatest Hits 2." There may have also been some others--especially soundtracks, but I can't find anything on that. Colgems was absorbed into Bell, and a Monkees greatest hits package was released later on, called "Refocus." "Lost Horizon" came out on Bell. Even a lone Micky Dolenz/Davy Jones single came out on Bell. But for all intents and purposes, the 1966-1971 run of the Colgems label--which morphed from Colpix and featured the Monkees as well as a number of other artists--was done. Since then, sparked by the continued popularity of the Monkees, the label has won cult status among collectors, who search out the lesser known artists on the label. The Monkees albums, of course, have been re-released several times, on both LP and CD. But what about the rest of the label? Much of the material continues to be in limbo, but based on what I have uploaded during the past couple of years, wouldn't it be interesting if some enterprising label actually legitimately released some of this material? Colgems was driven by the Monkees, but I will always fondly recall the record label as one with an eclectic lineup of artists and a number of interesting releases beyong the Pre-Fab Four stuff. I hope you have enjoyed these releases as much as I have enjoyed uploading them for you. P.S. : This site is far from dead now that I have released everything on the label. I have a few other things of interest that I will put on links to on this site during the next few months.